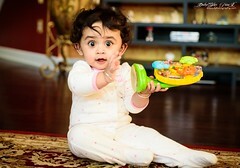 Publisher ! A interesting topic and some crucial aspects while working in BIP as a BIP geek . 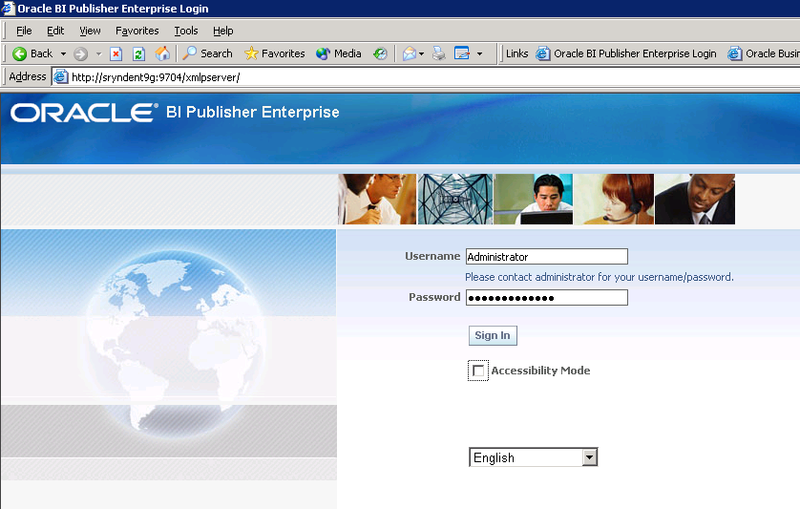 1) Login to BI Publisher using ‘Administrator’ / ‘Administrator’ and go to ‘Admin’ tab . 2) Go to ‘Security Configurations’ . 3) Check the option ‘ Enable Local Superuser’ and put the superuser name as ‘admin’ and password as ‘admin’ . This will make a option open so that you need not to change the SECURITY_MODEL parameter value to ‘XDO’ and ‘BI_SERVER’ to switch from local BI Publisher and BI Server based security. 4) Now change the Security model as per the below so that BI Publisher can talk with Presentation Services i.e Oracle BI Server . After changing click on Apply. 5) Restart the OC4J daemon. 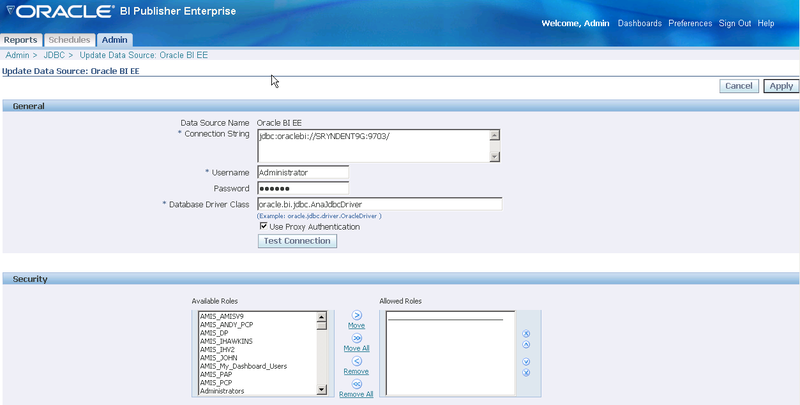 6) Sign-In to BI Publisher once again and you can get the below connection created under Admin-) JDBC -) Oracle BI EE . 8.) 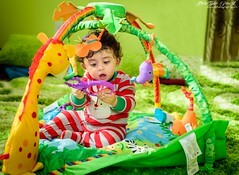 Now try to login using BI Server Administrator password . In my case it is ‘newpass9’ and you can get below screen. Note that here ‘Admin’ tab is missing which we will make visible after some more configuration settings. 9) You can get the same screen once you come from ‘BI Publisher’ option of Presentation Administrator. So now it is integrated but no Subject area no Shared Folder has been created and nothing has been setup it .Lets do that in next step. 10) Create a User group called ‘ XMLP_ADMIN’ in repository and assign the permission to be ‘Administrator’ . 11) Now Sign-In to BI Publisher using BI Server login credentials like ‘Administrator’/newpass9 .Here you go with Admin tab visible with the folders as well. 12) Click on any of the shared folder and you can get the option to create new report .Here I am creating a new report based on existing subject area is ‘testdeba’ . 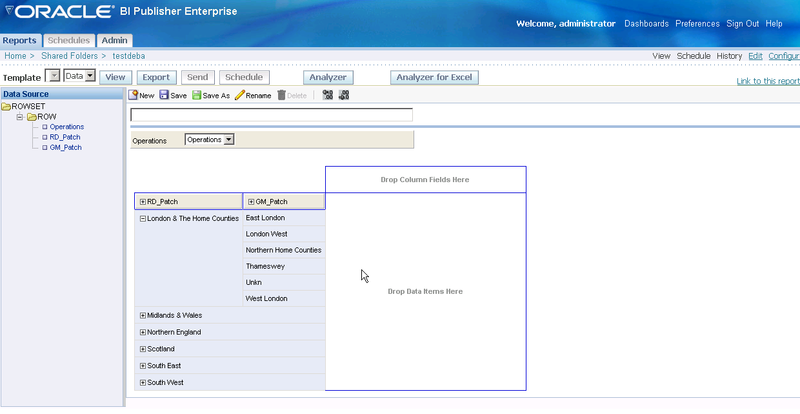 13) Edit ‘testdeba’ and create a new datamodel with default datasource set as ‘Oracle BI EE’ . 14) Click on ‘Query Builder’ and select the Schema i.e. the Subject area and select region. 15) Click on Save , then View and then Analyzer which will show below report after drag and drop left pane columns to respective regions . 16) So now the OBIEE Publisher is ready to work and details of how publisher would work is out of scope of this post. More more details refer the BI publisher Admin and User guide from Oracle. Copy : ‘Oracle_Business_Intelligence_Publisher’ folder from ‘..\OBI 10.1.3.3.2 Installer dir\Server_Ancillary’ to D drive. 2) Edit ‘xmlp-server-config.xml ‘ from path ‘D:\OracleBI\xmlp\XMLP\Admin\Configuration’ .Change as <property name=”SECURITY_MODEL” value=”XDO”/> . This would basically change the security model from BI Server security to BI Publisher Security. The security model uses the configuration role mapping defined under file path D:\OracleBI\xmlp\XMLP\Admin\Security\principals.xml. The encrypted password with default installer represents ‘Administrator’ always. 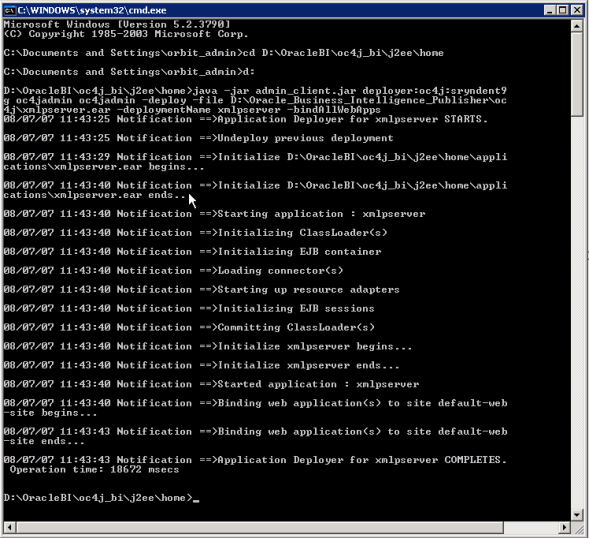 3) Lets restart the OC4J service and using default password for BI Publisher as ‘Administrator’ log into the system . 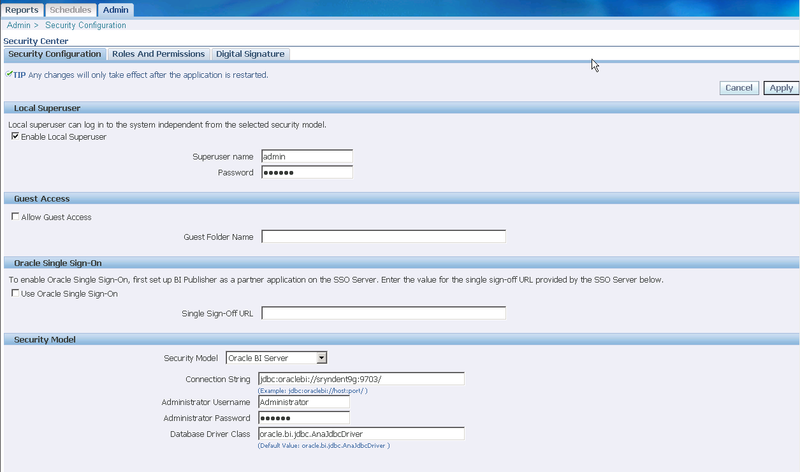 Okay now BI Publisher setup has been done for Publisher based security. Lets Sign Out . Now login to BI Presentation services using <host>:9704/analytics/saw.dll? 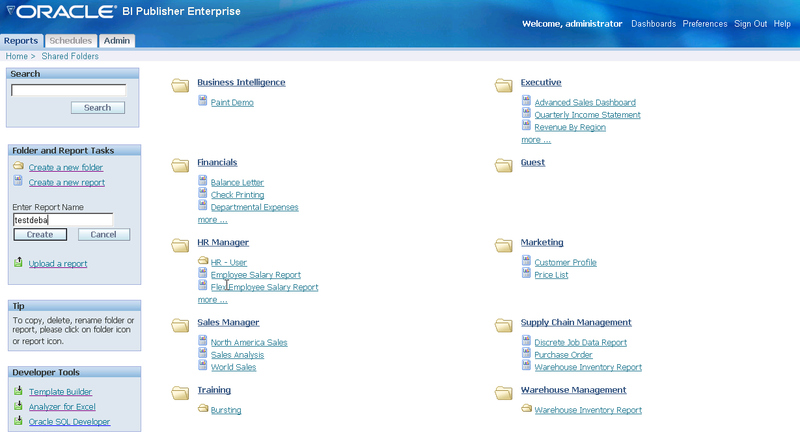 URL and Click on BI Publisher from More products . This is for obvious reason because local BI Publisher authentication is not based on BI Server security mode rather default BI publisher XDO security mode and here Presentation service operates only on BI Server authentication mode. So the compatibility for authentication has been failed . Lets make some more config changes to make it work in integrated mode followed by my next post . N.B : OBIEE 10.1.3.4 onwards there is no more hassles about deploying publisher module as full installation take all this configuration under consideration until and unless you remove Publisher module during customized installation. Although the above material helps to understand how actually the module get installed and pretty handy for your further investigation .